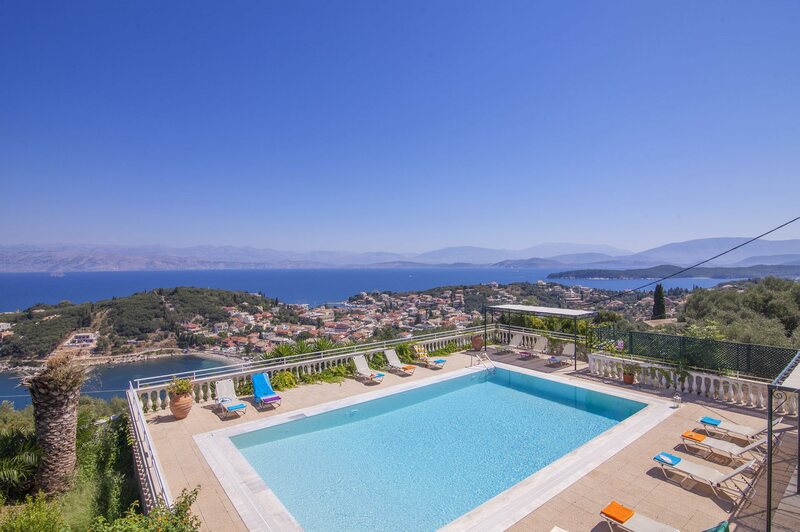 Corfu is known for its incredible scenery, and Villa Agathi has one of the best views of all our Corfu villas! Its position secures breath-taking views over the headland of Kassiopi to the open sea. Plus, it's only 5 minutes' drive from a selection of good beaches as well as the shops, bars and tavernas by the harbourside. This 7 bedroom house has a secluded, large sea-facing private pool - perfect for larger groups. Air conditioning/heating in the bedrooms, WiFi and pool heating are included. The stunning views can be enjoyed from the poolside as well as both levels. Plus, Kassiopi is only 5 minutes away! Outside, the terrace and large private pool have fantastic views over the Kassiopi headland. Directly off the ground floor lounge/dining room is a covered terrace and BBQ area. There is also a large pergola by the poolside, ideal for alfresco dining. A small track through the olive groves leads to the villa. As you turn the last corner, the view is breath-taking, the whole of Kassiopi town and sweeping sea views are set out beneath you. Villa Agathi has a private parking area and a pathway leads to the front door. Please note that the entrance to the villa is steep and the car group 1W minivan will not be suitable. The large open plan lounge and dining area on the ground floor has patio doors framing the sea views, allowing access to the pool terrace. A smaller lounge area with a private sea-facing terrace is on the second floor. Each level of the house has a kitchen area. There's also a utility room on the ground floor. On the ground floor is a twin bedroom with en suite shower room, accessed from the utility room. On the first floor is a double bedroom with an en suite shower room and 2 twin bedrooms sharing a separate bathroom. On the second floor is a twin bedroom, a double bedroom and a single bedroom, a bathroom and shower room. All bedrooms have access to a private terrace with spectacular views over the gardens and resort to the sea. This villa is registered and licenced by EOT Greek licensing association. This number is: 0829K122K0236501. It only takes 5 minutes to drive down the hillside into Kassiopi or to any of the beaches in the local area. The road leading into the resort has several restaurants to choose from, with a much greater choice of waterfront tavernas at the harbour. You'll have everything you need for an enjoyable holiday close at hand. Plus, there are also various cultural attractions, family activities and sightseeing opportunities to be discovered. Kassiopi has several shops selling clothes, souvenirs and beach accessories, as well as a couple of mini markets and supermarkets where you can stock up on daily essentials. The islands only market is in the capital, Corfu Town. Here, the stalls sell fresh locally caught fish, vegetables and fruit. The town centre is filled with gift and high street shops which, despite being an hours' drive south, is still well worth the journey. The road leading into the harbour has a few restaurants, with a greater choice of tavernas and lively bars around the waterfront. Here, there is everything from contemporary eating places to traditional venues and popular bars with Greek dancing, karaoke and live sports! Kassiopi has a couple of small but pleasant pebbly beaches around the headland, or you can visit the longer shingle beach of Imerolia, or the sandy bay of Kalamaki stretching away from the resort to the west. Children will love paddling and snorkelling in the sea. Aqualand Waterpark is an hours' drive back towards Corfu Town. In the true spirit of Greece, motor boats can be hired locally to explore the stunning bays of Kouloura, Kalami and Agni along the North East Coast. Alternatively, visit the islands highest point, Mount Pantokrator and admire the superb scenery. Or, why not explore the abandoned village of Old Perithia which, today, is being brought back to life as the ruined houses are renovated and summer tavernas cater for visitors. Corfu's only golf course is located a little over an hours' drive south in the Ropa Valley. Horse riding facilities, water sports and various boating excursions can all be found nearby. Villa Agathi is not available to book for season as it is sold out. Take a look here at the Corfu villas that are currently on sale. There is plenty to keep you occupied in and around the village if you can tear yourselves away from the private pool in your very own villa. Right outside your villa there are miles of gorgeous, unspoilt countryside to explore on foot or horseback. But if you fancy seeing more of the island on your holiday, Kassiopi makes a great base. Achavari, the main town in this area is nearby along the picturesque coastal road and worth visiting for its splendid 2 mile crescent of clean sandy beach, with warm shallow water perfect for playing and paddling. The beautiful 14 meter motor yacht, the Nautilus, offers trips around the North East coast of the island or a day or night time cruise round to Corfu Town. The boat has a BBQ and passengers will also have the chance to swim from the boat - perfect for snorkelling! Paleokastritsa has little boats that take up to 20 people on small tours to the nearby caves. The tours last about an hour and are a lovely way to admire the dramatic scenery and small caves of the West Coast. Calypso glass bottom boat leaves from Corfu old port on a regular basis. A large glass bottom boat it takes big groups to a spot just off the island of Vidos. The round trip takes about an hour and children can see sea lions and the fish around the island. Overall, brilliant time at villa Agathi. Thanks. Villa was excellent for a large group, the view must be the best on the island.